Talking Rocks Cavern is a great place in the Ozarks region where many of its visitors come to experience a unique outdoor fun in Branson. A “must see” attraction just minutes away from Silver Dollar City in Branson West, Talking Rocks Cavern requires no reservations to visitors. This fascinating cave has been a vital and long-standing part of Branson’s history. Explored by millions of visitors, the cave features beautiful landscape of glistening crystals and mystifying rock formations. This place is not only a gift of nature, it is also considered an engineering marvel due to many man-made embellishments such as the concrete steps along the pathways and the creative lighting installed to enhance the dramatic entrance to the cave. With the underground cave tour, you can enjoy above ground fun as well. From beautiful hiking trails and many tree-shaded picnic areas, you can experience a relaxing atmosphere and soak in the beauty of nature in the Ozarks. As you take a tour adventure with the Talking Rocks Cavern, you can participate in gemstone mining and take some treasures home. If you are a kind of sports enthusiast, you can try out the 9-hole Cave Country Miniature Golf Course. Open year round, seven days a week except Thanksgiving and Christmas, the cave is a great place to enjoy outdoor fun in Branson in a unique way. Talking Rocks Cavern started to become known in the early 1920’s when exploring caves was one of the earliest forms of tourism here in the Ozarks. Exploring the caves is still one of the most exciting outdoor activities in Branson to be experienced even today. The cave is one of the most favorite destinations for people of all ages to experience the fun of playing as a cave explorer. Once called as “Missouri’s Most Beautiful Cave”, Talking Rocks Cavern provides a different tempo from that of the usual entertainment shows and thrilling coaster rides. The glistening crystals and the majestically created stalactites and stalagmites formations provide the backdrop for an incredible adventure that every visitor will remember for a lifetime. Talking Rocks Cavern was originally named as “Fairy Cave” by an early cave developer, Truman Powell, after he first explored the cave. When the cave was discovered by Powell, he commented on it that it looked like “a subterranean fairy land”. 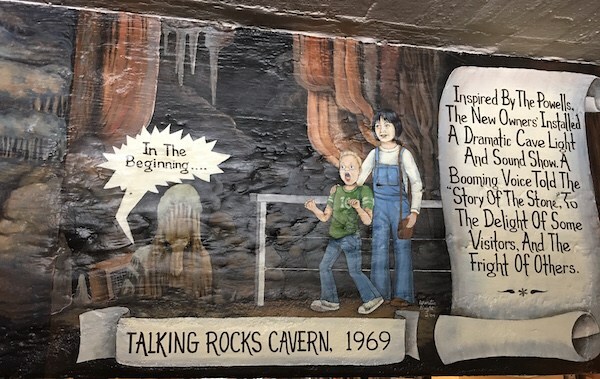 When the cave was purchased by Silver Dollar City in 1969, the name was changed to Talking Rocks Cavern. The new name was chosen after Waldo Powell, son of Truman Powell, had spent a lot of time looking at the rocks and mineral deposits in the cave, and noted that it is creating a sound, thus, it inspired a new name “Talking Rocks Cavern.” People of all ages visit the cave at any time of year as it has a comfortable 62 degree cave air. The hour long cave tour provides visitors a unique outdoor fun in Branson and edutainment, as well as learn its history and other geological information.